I'm 15 years old. I'm from Irkutsk. I was born here in 1983. This city is my hometown. I like my Irkutsk. It is very beautiful city. Here I have many friends. I'm studying in experimental school N44, in 9th grade "a". In our school study more 2000 students. My grade is learning Russian, History, Literature, English and others classes. My favorite subjects are English, History. In my free time I'm studying French. Also I like to play piano, listening music, read and swim. My favorite holidays are New Years Day and my Birthday, which I celebrate on the 15th of April. I like these holidays, because in these days I have get many presents. My family is not big. There are four persons: my parents, my brother and me. My mother's name is Lyudmila. She is 35 years old. She is engineer. My father's name is Victor. He is 40 years old. He is officer. My brother's name is Dima. He is 13 years old. He is studying in 7th grade of school N23. In his free time he like working with his friends. We also have a dog. Its name is Vicont-Boy. 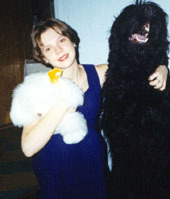 The pride of it is Russian Black Terrier. It is big and strong, but very, very funny. It is 6 years old. "Viki" is going in school, too. It like to play and sleep. I like it very much.